Since the release of this landmark report, the debate over the way American elections are financed has fundamentally changed. CED successfully demonstrated that business leaders support reform and representatives of the business community became prominent and outspoken advocates for reform for the first time because of CED's work. 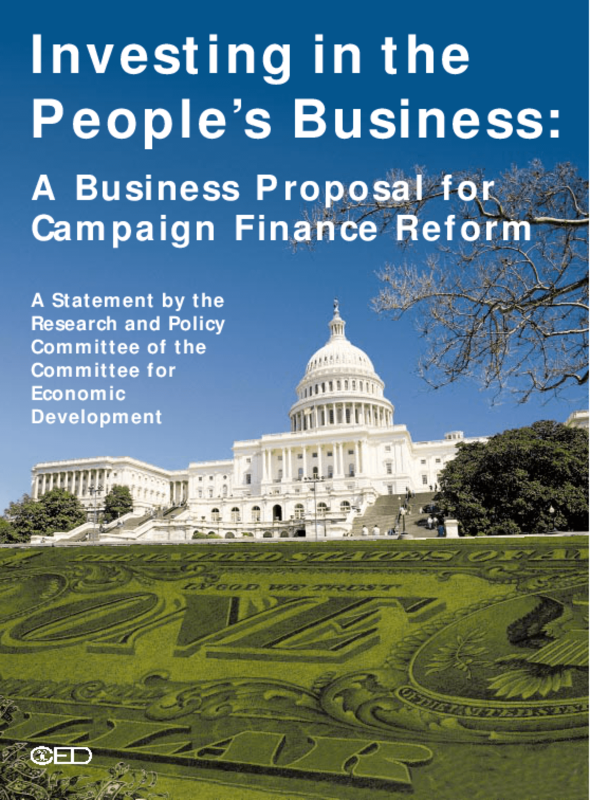 Investing in the People's Business calls for specific changes in U.S. campaign finance laws to enhance electoral competition, stem the flow of unregulated money, and shift financial influence from organized interests to individual voters and small contributors. Major recommendations include a ban on soft money; an increase from $1,000 to $3,000 on contribution limits to candidates and $2 for $1 public matching funds on small donations for candidates who adhere to spending limits. Over 300 CED Trustees and business leaders across the country have endorsed CED's recommendations to reform the campaign finance laws and have played an instrumental role in the successful effort to pass significant reform legislation.